The Bangor City Forest Report will soon be including trail maps and descriptions for trails in the Bangor Land Trust's Walden-Parke and Northeast Penjajawoc preserves. With the creation of the Northeast Penjajawoc and Walden-Parke preserves near Rolland F. Perry City Forest, the Bangor City Forest Report is expanding its information base to include those preserves, which are owned by the Bangor Land Trust. 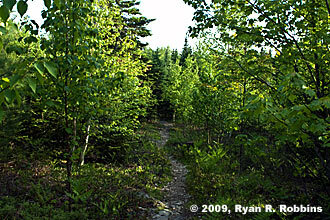 The Bangor City Forest Report will also include information on nearby Orono Land Trust trails from time to time. The reason for the expansion of information, which will include additional maps, is the northeast corridor of the city of Bangor features about 1,000 acres of land that’s available for public recreational use. Why limit information to just City Forest? City Forest will, of course, still be the focal point of this site. The change in “jurisdiction,” if you will, stems also from the change of the forest’s name from Bangor City Forest to Rolland F. Perry City Forest. Rather than change the name of this site, which would throw bookmarks and links to this site in disarray, I think it best that Bangor City Forest Report now refer to all of the forested land Bangor residents are fortunate to have access to. In the coming weeks, I will be adding maps and additional trail descriptions to the site. This will give outdoor enthusiasts a better guide to plan a hike or bike ride through all of the land available to public use. Allowing your dog to run free in the forest poses hazards to your dog, bicyclists, and others who want to enjoy the forest. The popularity of the forest has led to more complaints about dogs. So much so that the city of Bangor is looking into whether there should be formal rules on dogs in the forest. Should owners be required to keep their dog on a leash at all times? 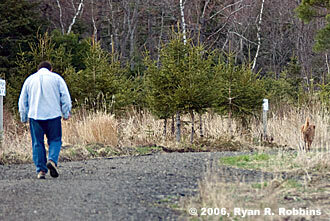 Should there be designated areas in the forest owners can allow their dog to roam off a leash? The city’s Parks and Recreation Committee is working on a survey of City Forest users to determine what the public’s sentiment is on the issue. There really is no sound reason to allow your dog to roam free without a leash. Every year, dogs that are supposedly well-behaved run off to chase wildlife or other dogs. Loose dogs can frighten young children, harass other dogs, harass wildlife, and pose an unnecessary hazard to bicyclists. Last week, a small dog that was supposedly under his owner’s command darted in front of a bicycle and was hit, despite the bicyclist’s best effort to slow down and steer away. Fortunately, the dog was not injured. In addition, curious dogs run a strong risk of sticking their nose where it doesn’t belong and getting a snout full of porcupine quills. Porcupines are quite plentiful in the forest. 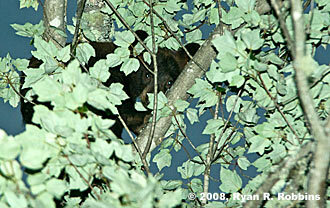 A black bear cubs peers down at a surprise visitor off Shannon Road in July 2008. The warm summer months mean increased activity for the black bears that call the area home. Although they are classified as carnivores, black bears feed extensively on vegetation, including bunchberry and raspberry, as well as skunk cabbage. They also eat insects, such as ant pupae and tent caterpillars. As long as you don’t bother them, they won’t bother you. In fact, chances are that you have been in the presence of a black bear without even knowing it. A report on black bears in City Forest will be available here next month. In the meantime, if you see a black bear, please let me know where you were, where the bear was, the date, and the time of day. So far there have been three confirmed black bear sightings this year: on the Veazie Railroad bed near Woodchuck Trail, on Bog Trail, and on Squirrel Trail. Last year there were at least three cubs whose range included the forest. Beginning this month, the cubs will be leaving their mother and heading out on their own. Any females in the bunch will continue to call the area around the forest home. Any males will gradually drift away over the next year or so before leaving the area completely. It is important that if you live in the area, especially in one of the new subdivisions, that you do not leave garbage outdoors, even the night before collection. Bears love the quick calorie fix garbage provides. They also love bird seed and are attracted to the smell of meat on the family grill. If you see a black bear while in and around City Forest, send me an e-mail with the details to let me know, as I’m working on a report on black bears that I will make available later this spring. © 2001-2011, Ryan R. Robbins. All rights reserved. cityforest.bangorinfo.com is a private endeavor and is not affiliated with the city of Bangor. No portion of this Web site may be reproduced in any form without the written consent of the author. Did you spot a factual error? Send a correction here.